Police investigating the disappearance of a three-year-old British girl from a Portuguese holiday resort say it appears she has been abducted. Officers say they have a suspect in mind, and believe Madeleine McCann remains in the area and is still alive. Her parents, from Leicestershire, left her at their apartment at Mark Warner's Ocean Club in Praia da Luz on Thursday, while they were at a nearby restaurant. 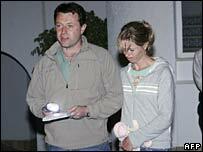 Doctors Gerry and Kate McCann have spoken of their "anguish and despair". In the first official briefing on the case, Guilhermino Encarnacao, director of the judicial police in the Faro region, said officers are working on the assumption she is being held between 3km and 5km (1.8 and 3.1 miles) from the resort. They had about 30 calls from potential witnesses and have created an artist's impression of a suspect. Responding to criticism that the police had been slow to respond, Mr Encarnacao said officers arrived at the scene 10 minutes after being alerted to the disappearance. An investigation unit began work within 30 minutes, he added. Police are expected to provide a further update on their investigation later. Relatives have flown to the Algarve to be with the couple, who were holidaying with their three children. 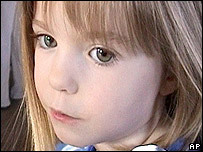 Speaking to press on Friday evening, Mr and Mrs McCann, from Rothley, pleaded for the return of their "beautiful" Madeleine. Mr McCann, with his wife at his side, read out an emotional statement outside the holiday apartments on Friday evening. "We cannot describe the anguish and despair we are feeling as parents of our beautiful daughter Madeleine," he said. "We request that anyone with any information relating to Madeleine's disappearance, no matter how trivial, contact the Portuguese police and help us get her back safely." The Ocean Club resort offered a creche service but the couple decided to leave Madeleine and two-year-old twins Sean and Amelie sleeping in the apartment. They had taken turns to return from the restaurant to check on their children. Madeleine, who turns four next Friday, was last seen by her father at about 2100 local time. When Mrs McCann went to check on her about an hour later, she found the bedroom's outside shutter and window had been opened and her daughter missing. Resort staff and guests helped the McCanns search the complex grounds into Friday morning and police were notified. Pictures of Madeleine have been widely distributed, and ports and the Spanish police put on alert. British Ambassador John Buck, who is with the McCanns in the Algarve, said they have been joined by three Family Liaison Officers from Leicestershire Police. Mr McCann's sister Philomena, criticised the Portuguese police for initially "playing down" their response to the disappearance. She has been in phone contact with her brother. Speaking from her home in Glasgow, she said: "He thinks it's just too little, too late. "It was hours before the local police turned up and we're talking two bobbies that totally downplayed the incident and said that Maddie had maybe just wandered off." However, she said that the family was elated to hear the police believed Madeleine was still alive. "There was a distinct feeling of elation, you know - but it's been a while since we actually heard it and it's really important to keep your emotions in check," she said. The Mayor of Lagos, Julio Barraso, defended the police from accusations that they had been too slow to act. He told BBC News 24: "During all the night of Thursday until Friday they have been here and they started the investigation and I believe that humanly it's not possible to ask for more."